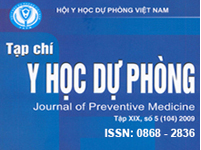 Le Thanh Sang and Nguyen Thi Nhung, two members of the SSRC-VASS Vietnam Population Health Study, published their research findings on “Impacts of the Atlantic Philanthropies' interventions on Commune Health Centers in rural Vietnam: A comparative perspective” in the Journal of Preventive Medicine. Their research applies difference-in-differences estimation and multiple regression analysis to panel data gathered from 3,600 household surveys in 2008/09 and 2013/14 and from case studies and in-depth interviews in 12 communes in northern, central and southern Vietnam. Results show that interventions supported by the Atlantic Philanthropies (AP) have had a positive impact on the proportion of people utilizing commune health centers (CHC) when they have an illness. The impact was stronger for those suffering from acute diseases than for those suffering from chronic diseases, which may be attributable to CHCs’ lack of capacity in chronic illness diagnosis and management. The research recommends that improving CHCs’ capacity to provide medical examination and treatment for chronic diseases be a priority for CHCs, in order to meet the needs of Vietnam’s aging population and of the poor and ethnic minorities, who depend solely on CHC services. Click here to download the article. Le, Sang Thanh and Nguyen, Nhung Thi, "Impacts of the Atlantic Philanthropies' Interventions on Commune Health Centers in Rural Vietnam: A Comparative Perspective," Journal of Preventive Medicine in 27, ed. , 2017, 11.